Copyright © 2013 Christian Wiesendanger. This is an open access article distributed under the Creative Commons Attribution License, which permits unrestricted use, distribution, and reproduction in any medium, provided the original work is properly cited. Viewing gravitational energy momentum as equal by observation, but different in essence from inertial energy-momentum requires two different symmetries to account for their independent conservations—spacetime and inner translation invariance. Gauging the latter a generalization of non-Abelian gauge theories of compact Lie groups is developed resulting in the gauge theory of the non-compact group of volume-preserving diffeomorphisms of an inner Minkowski space M4. As usual the gauging requires the introduction of a covariant derivative, a gauge field and a field strength operator. An invariant and minimal gauge field Lagrangian is derived. The classical field dynamics and the conservation laws for the new gauge theory are developed. Finally, the theory’s Hamiltonian in the axial gauge is expressed by two times six unconstrained independent canonical variables obeying the usual Poisson brackets and the positivity of the Hamiltonian is related to a condition on the support of the gauge fields. Field theory provides a powerful way to represent fundamental conservation laws of Nature in a mathematically consistent framework through Noether’s theorem which relates any global invariance of the underlying field theory under a continous symmetry group to a number of conserved currents and charges. Conservation of electric charge and -invariance, conservation of Color and -invariance or conservation of inertial energy-momentum and translation invariance in spacetime are but three key examples. Moreover, through the gauge principle the field theory framework allows to construct new fields together with their dynamics and through minimal coupling it allows to fix the coupling to other fields obeying a given global symmetry in a way which extends it to a local invariance of the thus completed field theory . The new fields transmit the physical interactions between the various minimally coupled fields (and between themselves in all cases with a non-Abelian underlying symmetry). The dynamics of the Standard Model (SM) has been modelled along this way starting with Electrodynamics, extending it to electro-weak interactions and finally adding Chromodynamics which models the strong interaction [2,3]. And General Relativity (GR) can be constructed along this way as well . There is, however, a crucial difference between the SM and GR when attempting to quantize the respective classical gauge field theories. The quantized SM is a perfectly consistent quantum field theory (QFT) related to its renormalizability—at least at the perturbation theory level. Any attempt to consistently quantize GR or extensions thereof have failed so far already at the perturbation theory level due to the intrinsic non-renormalizability of the theory [5,6]. Whereas in the SM spacetime and its Minkowskian geometry are an A Priori which serves as the arena within which the dynamics of the various matter and gauge fields unfolds GR declares spacetime itself a dynamical element whose geometry evolves alongside the changing energy-momentum distribution of the matter and gauge fields present. Not only does this dynamization of spacetime render GR non-renormalizable, but it also destroys basic concepts such as the energy-momentum density of the gravitational field or the relation between a quantized field and its corresponding particle which both rely on global translation invariance in spacetime and are crucial for the physical interpretation of a QFT [5,6]. where we have tentatively introduced the gravitational energy-momentum which we keep as an entity a priorily different from . Note that is conserved due to Equation (1). In GR is interpreted as an essential identity which leads to the aforementioned geometrical description of gravitation. In this paper we propose to follow a different route and investigate the consequences of viewing and or and as different by their very natures— the prevailing view before Einstein which comes at the price of accepting the observed numerical equality as accidential. Both and are four-vectors then which are conserved, but through two different mechanisms. Obviously the conservation of is related to translation invariance in spacetime. Let us use Noether’s theorem to separately derive the conservation of a new four-vector in a field theoretical framework relating it to a continous symmetry of the theory which we will call inner translation invariance. That four-vector is then interpreted as the gravitational energy-momentum . This will be the first step in developing an alternative route to describe gravity. The second will be to gauge the inner translation group and to develop the gauge field theory of inner diffeomorphisms technically leveraging earlier work on generalizing Yang-Mills theories to gauge groups with infinitely many degrees of freedom [7, 8]. The resulting Lagrangian and Hamiltonian dynamics are the basis to interpret the theory as a theory of gravitation  and to show its renormalizability at the QFT level  in two forthcoming papers. The notations and conventions used follow closely to those of Steven Weinberg in his classic account on the quantum theory of fields [2,3]. They are presented in the Appendix. In this section, we introduce the concept of global diffeomorphism invariance in inner space for a generic field theory in order to generate a new conserved four-vector through Noether’s theorem which will serve as gravitational energy-momentum. The restriction to volume-preserving transformations will automatically ensure global gauge invariance of the theories we look at in the sequel and will prove crucial for the consistency of our approach. To represent this group in field space we have to add additional degrees of freedom in complete analogy to the Yang-Mills case where fields become vectors on which representations of a finite-dimensional symmetry group act. where we introduce a parameter of dimension length, , so as to define a dimensionless scalar product. will play an important role in the definition of the gauge field action later. Note that the fields might live in non-trivial representation spaces of both the Lorentz group with spin and of other inner symmetry groups such as . All these scalar, spinor and gauge vector fields —apart from the gauge field related to diffeomorphism invariance to be introduced below—are called “matter” fields in the following. These representations factorize w.r.t the diffeomorphism group representations we introduce below which is consistent with the Coleman-Mandula theorem. with a real Lagrangian density . The integration measure in inner space comes along with a factor of to keep inner integrals dimensionless. The subscript denotes generic fermionic and bosonic matter in this context. as anti-unitary operators w.r.t. the scalar product Equation (4). Both the and the are anti-hermitean w.r.t. the scalar product Equation (4). The decomposability of w.r.t. to the operators will be crucial for the further development of the theory, especially for identifying the gauge field variables of the theory. Here we have used the unimodularity condition so that the -integration yields zero for fields and gauge parameters vanishing at infinity in X-space. As a result any matter Lagrangian is automatically globally gauge invariant under volume-preserving diffeomorphisms. which generate the inner global coordinate transformations in field space. It is these currents and charges which will be interpreted in terms of gravitational energy-momentum and become the sources of gauge fields. In this section we introduce local gauge transformations and—to make globally invariant Lagrangians locally invariant—the corresponding covariant derivatives, gauge field and covariant field strength operators. We also define global inner scale transformations under which the covariant derivative, gauge field and covariant field strength operators are invariant. Let us extend the global volume-preserving diffeomorphism group represented in field space to a group of local transformations by allowing to vary with as well, i.e. allowing for -dependent volume-preserving general coordinate transformations in inner space. In other words the group we gauge is the group of all isometric diffeomorphisms preserving the volume in inner space. The formulae Equations (6) together with Equation (7) still define the representation of the volume-preserving diffeomorphism group in field space. again due to the unimodularity condition . consistent with . As a consequence the usual ordering problem for and in the definition of does not arise and is anti-hermitean w.r.t to the scalar product defined above. respecting . The inhomogenous term assures the desired transformation behaviour of the , the term rotates the inner space vector and the term shifts the coordinates . Note that the consistent decomposition of both and w.r.t. the generators is crucial for the theory’s viability. It is ensured by the closure of the algebra Equation (7) and the gauge invariance of for gauge parameters fulfilling . Under Equation (27) matter Lagrangians and the operators , and are invariant which will prove crucial to consistently define the theory below. In this section we introduce a metric in the inner space and derive the gauge field Lagrangian minimal in the sense of being gauge-invariant and of lowest possible dimension in the fields. As heuristically motivated by analogy to the YangMills case we propose the local gauge field Lagrangian to be proportional to —ensuring gauge invariance and at most second order dependence on the first derivatives of the -fields which is crucial for a quantization leading to a unitary and renormalizable theory. where acts on all fields to its right. under the -operation and using . This assumes, however, the existence of Cartesian coordinates and a metric in inner space and the existence of both coand contravariant vectors w.r.t. that metric. So let us endow the inner four-dimensional real vector space with a metric of Minkowskian signature and require that its geometry—which we take as an a priori—is flat, . This means that it is always possible to choose global Cartesian coordinates with the metric collapsing to the global Minkowski metric. Such choices of coordinates amount to partially fixing a gauge and we will call them Minkowskian gauges in the following. which has still to be properly defined. Above we have made use of and the subscript denotes evaluation in a given coordinate system and for a given metric, in this case Cartesian coordinates and the Minkowski metric. Note that beeing a total divergence in -space and odd in the second term in Equation (31) vanishes. denote the forward and backward light cones. which is a positive and finite Lorentz scalar for all . Explicitly we find . As is the only a priori mass scale in the theory any other Lorentzinvariant regularization procedure just changes the numerical values of . Note that regularized in this way any inner -integral over polynomials in P reduces to products of the metric in inner space and and is as well behaved as the usual sums over structure constants of a compact Lie group are in a Yang-Mills theory. where we have to contract the inner indices with now. The expression above is obviously well defined in any coordinate system and gauge-invariant under the combined transformations of field strength components Equations (26) and the metric Equation (30). Both are dimensionless in inner space—the Lagrangian density due to the factors of . Note that the factor of above leads to the usual normalization of the quadratic part of the Lagrangian density and the overall minus sign will yield a positive Hamiltonian as we will show in the section on Hamiltonian field dynamics. with a similar relation holding for the matter Lagrangian Equation (5)—the dependence of the theory on is controlled by the scale transformation Equation (27). In other words theories for different are equivalent up to inner rescalings. This is a crucial point which will allow us to rescale always to the Planck length, a fact we will use when extracting the physics of the theory at hands. Why have we not simply written down Equation (41)? First, the calculation starting with the -operation shows that the dimensionful parameter automatically emerges in the definition of the Lagrangian and that the theory at is related in a simple way to the one at . We would not have uncovered this somewhat hidden, but crucial fact in simply writing down the Lagrangian. Second, we will have to show in the quantized version of the theory that the kinematic integrals generalizing the kinematic sums over gauge degrees of freedom in the Yang-Mills case can be consistently defined. The definition of is a first example of how this will be achieved. 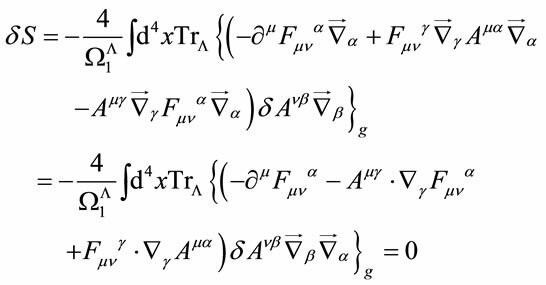 In this section we develop the Lagrangian field dynamics determining the field equations which will not depend on the metric g and derive the most important conservation laws for the theory. which by inspection do not depend on the metric. This means that the metric g is not an independent dynamical field and irrelevant for the dynamics of the gauge fields. Above we have used the cyclicality of the trace, partially integrated and brought all the to the right. Note that under the trace all terms with an odd number of vanish. underlining the formal similarity of the present theory to Yang-Mills theories of compact Lie groups. which obey the restrictions on algebra elements as expected. and generates the translations in spacetime. In addition, the theory is obviously Lorentz and—at the classical level—scale invariant under the corresponding spacetime and field transformations. We do not display the corresponding conserved currents and charges here. 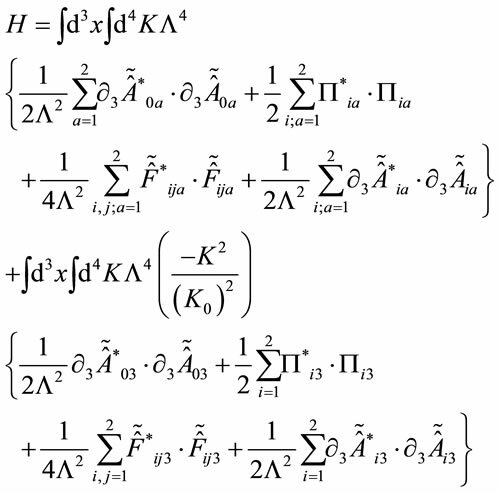 The equations above define a perfectly consistent classical dynamical system within the Lagrangian framework. Note that for physical observables such as the energy-momentum tensor the inner degrees of freedom are integrated over. As we ultimately aim at quantizing the theory we next turn to develop the Hamiltonian field theory. In this section we develop the Hamiltonian field dynamics closely following . We fix a gauge first choosing Cartesian coordinates along with the Minkowski metric in inner space and second eliminating the first class constraints related to the remaining gauge degrees of freedom by imposing the axial gauge condition. We then explicitely solve the remaining constraints and find the unconstrained canonical variables for the theory. Finally we re-express the gauge-fixed Hamiltonian H of the theory in these variables displaying its positivity explicitly. This will serve in  as the starting point for quantization. where the are the gauge fields, are given by Equation (25) and where the -indices are raised and lowered with . which are the field equations Equation (46) for and . where we have used . further reducing the independent variables to , , , , , and the respective s.
where we have made use of Equations (62) and (64) to rearrange terms and where is given by Equation (65). Note that as expected. We immediately recognize that positivity of is ensured by the independent field variables of the theory vanishing outside the set , i.e. which is obviously a Lorentz-invariant requirement. Hence we restrict all fields in inner -space to have positive mass-squared support in which defines in turn the class of admissible functional spaces for the fields of the theory. Note that the Fourier-transformed fields constant in -space have support and hence positive . The time evolution is compatible with the support condition Equation (71). Together, Equations (76) and (79) constitute a perfectly consistent classical Hamiltonian field theory for the -fields and their conjugates . Note finally that both transformations (1) the inverse of Equation (75) rotating the fields with orthogonal matrices in field space and (2) the inverse Fourier transformation back to -space of fields with positive mass-squared support in -space are canonical, hence allowing us equally well to start with the Hamiltonian given by Equation (70) where and are expressed in terms of the independent variables and . The positivity of the Hamiltonian is again assured by the restriction to fields whose Fourier-transformed live in the functional spaces of fields with positive masssquared support in -space, a fact which is hidden working in the original -variables. The Poisson brackets though get replaced by the appropriate Dirac brackets . Let us finally comment on the inclusion of matter fields. The minimal coupling prescription suggests to couple matter by (1) allowing fields to live on — adding the necessary additional inner degrees of freedom —and by (2) replacing ordinary derivatives through covariant ones in matter Lagrangians as usual. As this prescription involves scalars in inner space only and as the volume element is locally invariant, the metric does not appear in minimally coupled matter actions. Note that this prescription allows for a universal coupling of any matter field to the gauge fields of the theory treating them as scalars in inner space. Technically no fundamentally new difficulties arise and the relevant matter terms are simply added to the formulae for both the Lagrangian and Hamiltonian gauge field theories of the group of volume-preserving diffeomorphisms of . In this paper we have started to explore the consequences of viewing the gravitational energy momentum as different by its very nature from the inertial energymomentum , accepting their observed numerical equality as accidential. This view has motivated us to add new field degrees of freedom allowing to represent an inner translation group in field space in order to generate a new conserved fourvector through Noether’s theorem which we interpret as gravitational energy momentum . Gauging this inner translation group has naturally led to the gauge field theory of the group of volume-preserving diffeomorphisms of with unimodular Jacobian, at the classical level, thereby generalizing nonAbelian gauge field theories with a finite number of gauge fields. In contrast to that case, in order to gauge coordinate transformations of an inner we had to introduce an uncountably infinite number of gauge fields labeled by , the inner coordinates of the fields on which we represent the global and local gauge groups. This has not brought along fundamental difficulties as far as the definitions of the covariant derivative, the gauge field and the field strength operators are concerned. As the components of these operators are vectors in inner space we then introduced a flat metric on in order to allow for coordinate-invariant contractions of inner space indices, making it the inner Minkowski space . Potentially fundamental difficulties, however, have arisen in the definition of other crucial elements of the theory—such as the trace operation in the definition of the gauge field action. Tr turned out to be a potentially divergent integral over the non-compact inner . Accordingly we had to defined the trace operation using the scale parameter inherent to the theory as a cutoff and have shown that the theories for different are in fact related to each other by an additional global inner scale symmetry of the theory. We then have proposed—with consistent quantization in view—a covariant, minimal gauge field Lagrangian. Next, we have derived the field equations and shown their independence of the inner metric . Finally we have determined the conserved Noether currents and charges belonging to the inner and spacetime symmetries of the theory including the energy-momentum density of the gauge fields. The natural framework to consistently deal with gauge fixing, to implement the constraints and to both define a classical field theory and prepare its path integral quantization is the Hamiltonian formalism for which we have derived the theory’s Hamiltonian and the corresponding Hamiltonian dynamics through choosing Cartesian coordinates with a Minkowski metric in inner space—partially fixing a gauge—and imposing on top the axial gauge condition to fully fix the gauge. A key condition for the viability of the theory is the positivity of the Hamiltonian. A careful analysis relates to a quite natural restriction for the support of the Fourier-transformed gauge fields being limited to the forward and backward light cones in inner -space. In addition, this analysis uncovers a set of two times six unconstrained independent canonical variables obeying the usual Poisson brackets with which the theory can be formulated and which will serve as the starting point for quantization . The result is a classical field theory formulated on flat four-dimensional Minkowski spacetime which is invariant under local gauge transformations and at most quartic in the fields—a perfect candidate for a renormalizable, asymptotically free quantum field theory. In two separate papers we show that the present theory encompasses classical gravitation at the Newtonian level in a natural way  and that the quantized gauge theory of volume-preserving diffeomorphisms of is re-normalizable and asymptotically free at one-loop . L. O’Raifeartaigh, “Group Structure of Gauge Theories,” Cambridge University Press, Cambridge, 1986. C. Rovelli, “Quantum Gravity,” Cambridge University Press, Cambridge, 2004. C. Wiesendanger, “II—Conservation of Gravitational Energy Momentum and Poincaré-Covariant Classical Theory of Gravitation,” arXiv:1103.0349 [math-ph]. C. Wiesendanger, “III—Conservation of Gravitational Energy Momentum and Renormalizable Quantum Theory of Gravitation,” arXiv:1103.1012 [math-ph]. Generally, denotes the four-dimensional Minkowski space with metric , small letters denote spacetime coordinates and parameters and capital letters denote coordinates and parameters in inner space. Specifically, denote Cartesian spacetime coordinates. The small Greek indices from the middle of the Greek alphabet run over 0, 1, 2, 3. They are raised and lowered with , i.e. etc. and transformed covariantly w.r.t. the Lorentz group . Partial differentiation w.r.t to is denoted by . Small Latin indices generally run over the three spatial coordinates 1, 2, 3 .
, i.e. etc. and transformed as vector indices w.r.t. . Partial differentiation w.r.t to is denoted by .